To apply Six Sigma to your business and produce the best results, you need to understand what Six Sigma is, the principles of Six Sigma, and the DMAIC problem-solving method. The correct tools and use of the Six Sigma scale and methods will keep your data dependable and reusable. Y=f(X) + ε: All outcomes and results (theY) are determined by inputs (theXs) with some degree of uncertainty (å). To change or improve results (the Y), you have to focus on the inputs (theXs), modify them, and control them. Variation is everywhere, and it degrades consistent, good performance. Your job is to find it and minimize it! Valid measurements and data are required foundations for consistent, breakthrough improvement. Only a critical few inputs have significant effect on the output. Concentrate on the critical few. Every decision and conclusion has risk (ε), which must be weighed against the context of the decision. 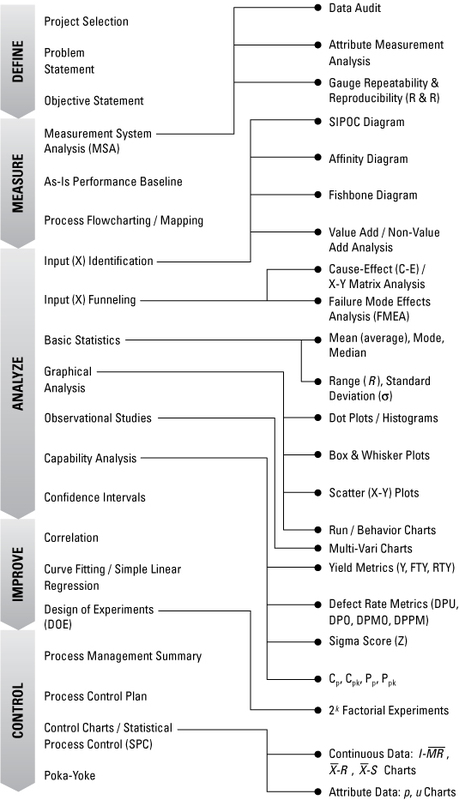 The DMAIC (Define-Measure-Analyze-Improve-Control) project method is a formalized problem-solving process of Six Sigma. It’s made-up of five steps to apply to any procedure of a business to improve effectiveness. Define: Set the context and objectives for your improvement project. Measure: Determine the baseline performance and capability of the process or system you’re improving. Analyze: Use data and tools to understand the cause-and-effect relationships in your process or system. Improve: Develop the modifications that lead to a validated improvement in your process or system. Control: Establish plans and procedures to ensure that your improvements are sustained.